Today we're launching a new registration plugin that gives website owners the ability to offer quick, easy and social options for sign-up. By minimizing the friction associated with signing up for a new account and making it easy for people to bring their friends with them, we've seen that people are more likely to complete the sign up process, stay on sites longer, share more content, and come back more often. 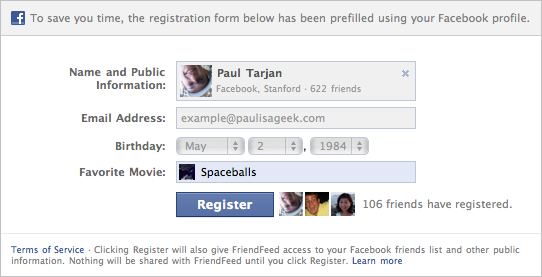 For example, in beta tests with FriendFeed, Facebook sign ups increased 300%. The registration plugin is an iframe that websites can add with just one line of code, and customize to request the specific fields required to create an account. When a user is logged into Facebook and arrives at the registration plugin on a website, they'll see that the form is prefilled with the relevant information he or she has already shared on their Facebook profile. Users can see the specific information the site is requesting of them, giving them more control to decide whether to sign up. The site can request information stored on Facebook (e.g., name, verified email address, current location, etc.) or custom information (e.g., text fields, checkboxes, dropdown menus, security checks, typeaheads, etc.). Users can decide whether to share their information with the site by clicking "Register," or if a Facebook account isn't required by the site, select an option to fill out the form manually. Because the plugin works through an iframe, no data is shared with the website until the user clicks "Register." p>When a user registers for the site with their Facebook account (similar to Facebook Login), the site is given permission to access the user's basic information on Facebook in addition to the data presented in the form, and in turn can provide the user with a personalized and social experience. The redirect-uri should point to the page which will process your signed_request. You can customize the fields attribute to suit your needs. See the docs for a list of valid fields. The redirect-uri and fields are identical to above. You must use your own app_id for the redirect-uri to be on your domain. For more details on getting started with your implementation, please visit our technical documentation. Paul, an engineer on the Platform team, will register for your site if you use this plugin. 1 more user!